I'm happy to be back with another card as the March GD for Just Us Girls. 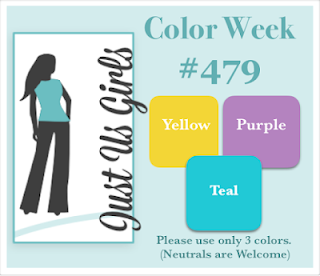 It's Color Week with the beautiful combo of Yellow, Purple & Teal You're also allowed to use neutrals. I immediately thought of Easter, but wanted to use my still unopened SSS Sweet Tulip die rather than eggs. My background has shades of purple & teal that are a bit darker to make the die cut really stand out. I used a favorite Copic marker technique I learned years ago from Nicole Heady. You simply make stripes of each color & go back to blend where they meet until you're happy with the result. The colors I used are Amethyst & Blue Green. I cut the panel down & attached it to a white card. The tulip die cut was stacked 2 high & white heat embossed. I removed the top layer inside pieces, covered them in Art Institute Banana glitter & glued them back into place. The white heat embossing gives a neat look & the glitter is really beautiful in person. 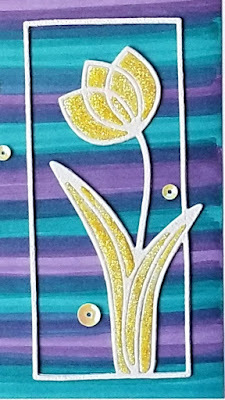 Hero Arts yellow sequins provide embellisment & the Easter sentiment is on the inside of the card. Think I'll make more of these in other colors. Hope you'll check out the wonderful cards made by the DT & play along in the challenge. I'm entering Virginia's Show & Share challenge. Hi Greta! I'm back from Vacation! Thought I'd pop in to see what I've missed! Beautiful cards.. Love seeing all your designs and the background on this one is beautiful!! Have a great weekend! WHat a great eye for colour Greta, the purple and teal make the perfect backdrop for the golden tulip, beautiful. That is a brilliant idea with the stripes. I must give that a try. It looks lovely here with the tulip due cut. I love the vibrant colours on this card. Hugs Mrs A.
fantastic way to incorporate the colors for this challenge, Greta - gorgeous tulip! I love your background and the colors. Just beautiful. The gold glittered tulip is so gorgeous. Great card! Fab use of the colors -- this is an awesome card. Another fab card for your gd at Jugs. Love these colors, you rocked it. love the way you used the colors...fabulous design! I really must get my act together and play along with one of the challenges before the month is over. Those are tough colors, but you've nailed it Greta! This is a wonderful spring card! What a gorgeous card. I love all the bright beautiful colors of the striped background. The flower rests magnificently on it. GREAT take with the colors! I love the stripy background! So glad that you join the fun with my “Show & Share”! WONDERFUL! I would not know where to start with this colour palette, but you nailed it and turned out a super classy card. I love the tulip treatment with the shimmery highlights. Thanks for the inspiration. I remember Nichole doing this technique! This is so pretty. Your background came out beautifully and I love the glitter on the inlaid pieces. 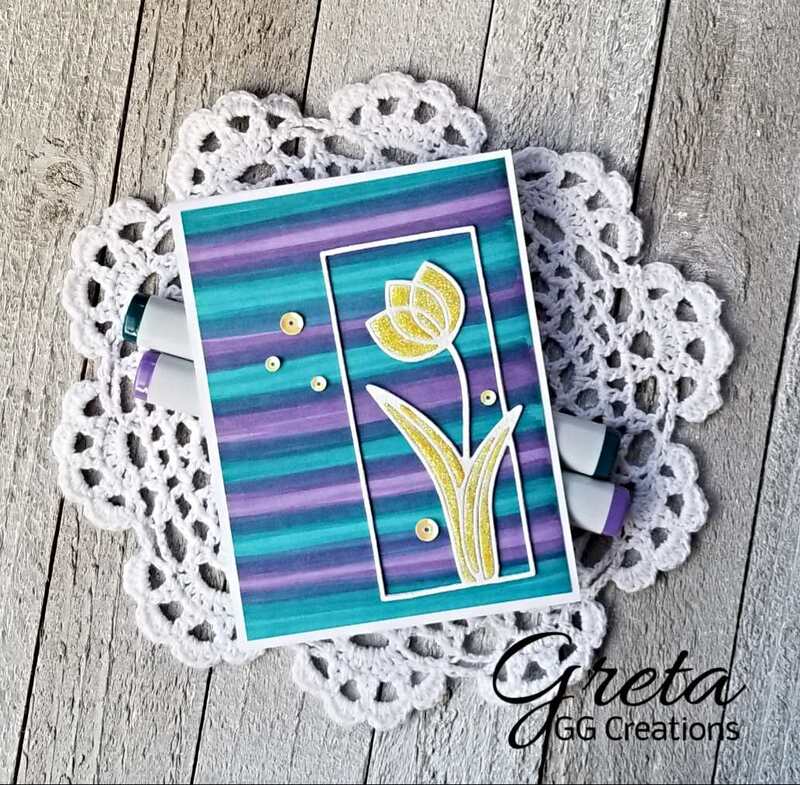 Beautiful card Greta! LOVE LOVE LOVE the background Greta. And that inlaid glitter is stunning. Your background looks amazing with such beautiful blending of those colors! And I love what you did with that tulip die with the heat embossing and the glittered inserts. Beautiful card! Oh! I love the colour combo and how you have used it. A gorgeous card. Awesome card. It is quite lovely. I love how the flowers are colored. Fabulous background Greta. That tulip is just gorgeously sparkly. So elegant. Greta the colours work so beautifully! It's a stunning card. What a wonderful way to highlight the lovely flower! Love all the sparkle and it looks so pretty against the colorful striped background! Oh Greta!!! Your background came out beautifully and I love the glitter on the inlaid pieces. Beautiful card as I mentioned!! So impressive! What a stunning effect... This is so lovely my friend! I love your Copic made striped background, Greta. 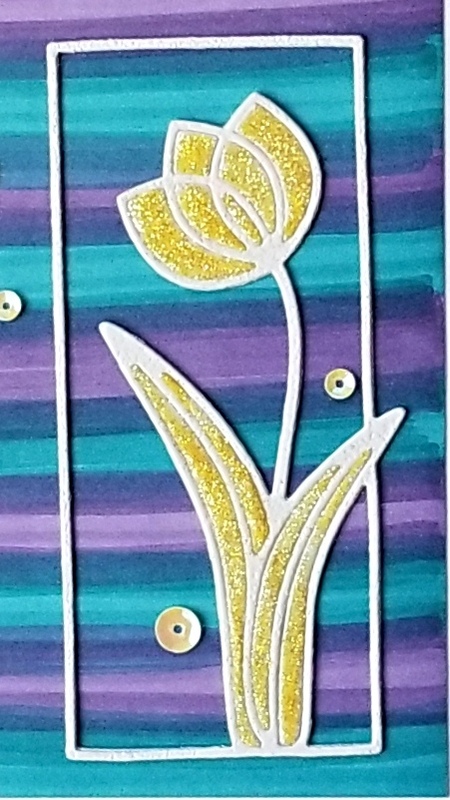 It is so bright and cheery and perfect with the yellow glitter tulip. WOW...this is one amazing card, just love your fabulous background! Wow! That background! I would have never thought it was Copics! Such a striking look, especially backing that gorgeous tulip. So, so pretty!